First N Goal Inflatable Football Bungee Challenge - No one has ever played football quite like this! The ultimate football challenge! First N Goal Tug of War - No one has ever played football quite like this! A fun and entertaining way to get some exercise and healthy competition going. 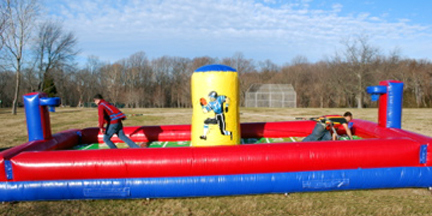 2 players stand atop a "football field" and are attached to 2 ends of a bungee cord. The object of the game is to score 3 footballs in the "goal" before their opponent. In order to get close to the goal, the player has to stretch the cord, while their opponent tries to do the same - putting both players on offense and defense at the same time. Includes: inflatable, 1 blower, vests, bungee cord, balls and 1 attendant.